A bunion is a bone deformity caused by an enlargement of the joint at the base and side of the big toe (metatarsophalangeal joint). Bunions form when the toe moves out of place. The enlargement and its protuberance cause friction and pressure as they rub against footwear. Over time, the movement of the big toe angles in toward the other toes, sometimes overlapping a third toe (known as Hallux Varus). The growing enlargement or protuberance then causes more irritation or inflammation. In some cases, the big toe moves toward the second toe and rotates or twists, which is known as Hallus Abducto Varus. Bunions can also lead to other toe deformities, such as hammertoe. Many people with bunions suffer from discomfort and pain from the constant irritation, rubbing and friction of the enlargement against shoes. The skin over the toe becomes red and tender. Because this joint flexes with every step, the bigger the bunion gets, the more it hurts to walk. Over time, bursitis or arthritis may set in, the skin on the bottom of the foot may become thicker, and everyday walking may become difficult--all contributing to chronic pain. Wearing shoes that are too tight is the leading cause of bunions. Bunions are not hereditary, but they do tend to run in families, usually because of a faulty foot structure. Foot injuries, neuromuscular problems, flat feet and pronated feet can contribute to their formation. 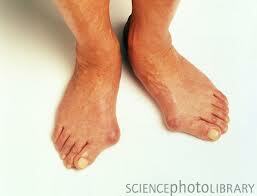 It is estimated that bunions occur in 33 percent of the population in Western countries. The use of protective padding, often made from felt material, to eliminate the friction against shoes and help alleviate inflammation and skin problems. Changing to carefully-fitted footwear designed to accommodate the bunion and not contribute toward its growth. Orthotic devices--both over-the-counter and custom made--to help stabilize the joint and place the foot in the correct position for walking and standing. Depending on the size of the enlargement, misalignment of the toe and pain experienced, conservative treatments may not be adequate to prevent progressive damage from bunions. In these cases, bunion surgery, known as a bunionectomy, may be advised to remove the bunion and realign the toe.